A once embattled World Trade Center developer, Larry Silverstein is praising the rate of construction at the World Trade Center. So much so, that his optimism has predicted the World Trade Center site to be fully completed in the next five to six years, as reported by NY1.com. “Here we are, after nine years of this, and this thing is now moving forward at a terrific pace, and we are thrilled with the acceleration and the reality of what’s transpiring before us on a daily basis,” Silverstein is quoted in the same report. Silverstein’s relationship with the Port Authority in regards to the rebuilding of World Trade Center can be described best as contentious. Silverstein who developed the first tower to rise, 7 World Trade Center, has often complained over the speed of which it was taking the Port Authority to move ahead with the rebuilding of his other buildings, which include 2 World Trade Center, 3 World Trade Center and 4 World Trade Center. In March, after 9 years of negotiation towards financing, Silverstein and the Port Authority finally reached a tentative agreement and commenced with construction. Tower 2 will be built only to street level, deferring the air rights back to Silverstein if the economy should pick up. 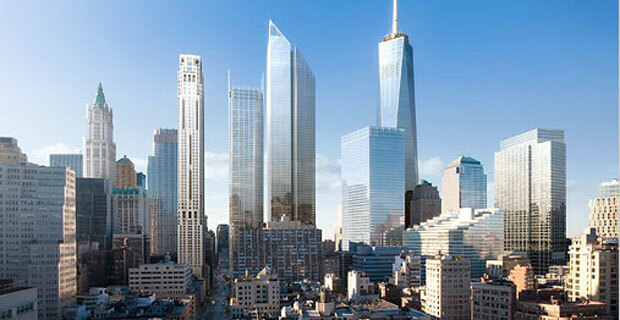 What do you think about the rate of construction at the World Trade Center so far?